Veteran: Lê Văn Út, 67 years old (first, left), in charge of construction method for a team of seniors who build bridges and roads. Team members learned construction technique from a local in Lấp Vò district and their friends. 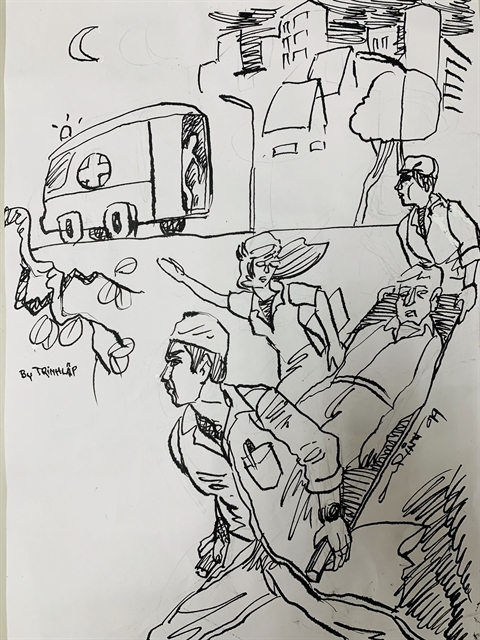 A team of veterans unwilling to idle their retirement days away deliver yeoman service to their communities by working hard, for free, to build bridges and roads. 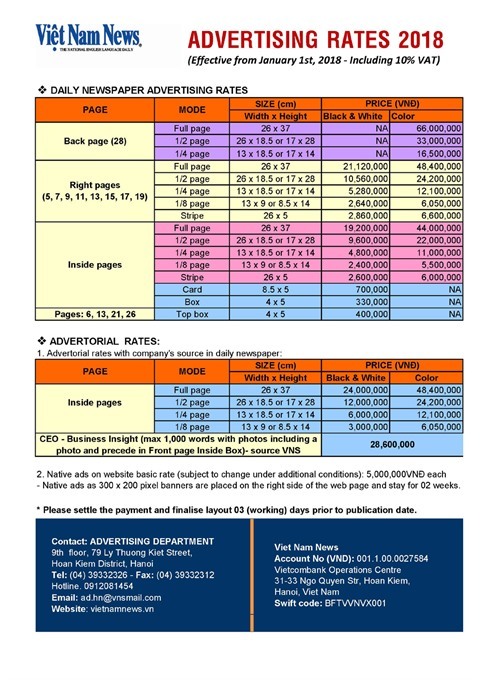 Nguyễn Hành and Nguyễn Vân report. It was a scorching hot day when I attended the launching of a bridge over the Cái Bàn River in the Mekong Delta province of Đồng Tháp. But it was not the heat that warmed the cockles of my heart, and that of others present at the ceremony. This bridge had been built by people in their late sixties, seventies and eighties, voluntarily, charging nothing for their labour. 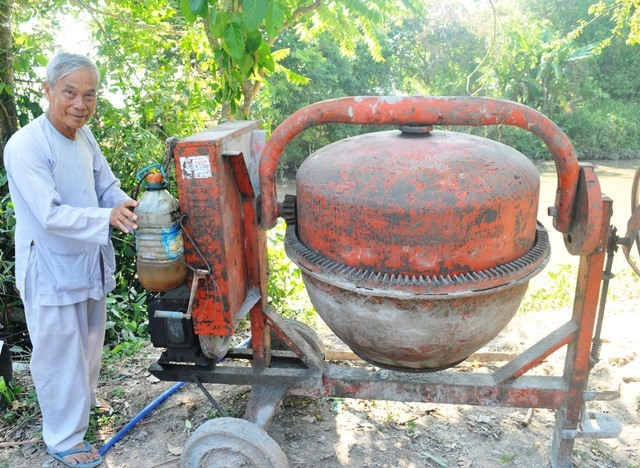 Võ Văn Lộc, a 82 year old native of Tân Hòa Commune in Đồng Tháp, was a founder of the voluntary construction team in 2008. Initially, it had less than ten members, but boasts more than a hundred now. Over the last years, the team has worked hard to build more than a hundred new bridges and upgrade several dozen kilometres of roads to help local people. “My hometown is poor and quite far from the province’s centre. 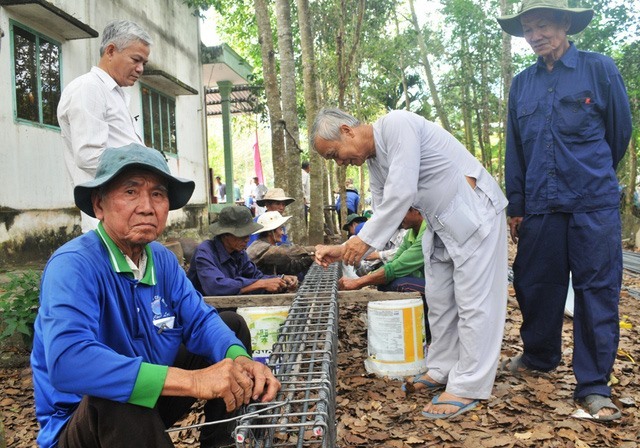 Seeing locals, especially children, having to use the cầu khỉ (foot bridges) which are unstable and unsafe, my neighbours and I (all senior citizens) decided to form a team to construct bridges in the locality in order to make local’s lives easier,” said Lộc. Foundation: Part of a bridge being constructed by the team of seniors. The team has built more than a hundred cement bridges and more than 15 kilometres of road have been built over the last nine years. 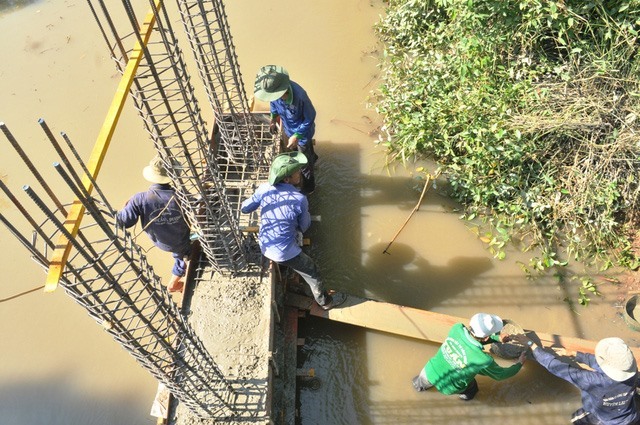 Over nearly ten years, the team has built more than 100 bridges 2 to 4.5 metres wide and 20 to 45m long, Lộc said. At first the team would identify a dilapidated bridge and replace it with a new one under the approval of the authority. However, after they built a dozen or so bridges this way, the team became well-known and local authorities began contacting them, said Lộc. “When we [the construction team] get a new project, we will study the site, make a design for the bridge and give the authorities an estimate of expenditure. In recent years, local authorities have been giving us 25 per cent of total funding for a project. Together with the locality, we then call for donors to get the remaining funds. Finally the construction team starts the work, and we do it for free,” said Lộc. In the first few years, because they lacked people as well as enough construction knowledge and experience, they only built wooden and cement bridges of less than 1.5 tonne weight limit. “In 2010, we realised that we had to replace existing bamboo and wooden bridges with strong and durable cement bridges. If we continued to build bridges that were just 2 metres wide and had a 1.5 ton limit, they were no longer of practical use in a few years. Lê Văn Út, 67, is in charge of construction methods. He said, “We haven’t attended any official class for such things, we just learnt how to construct bridges from Hai Đâu and our friends." “When we build bridges, we have to carefully study reinforced concrete construction and things like that. Other skills such as organising and allocating jobs are also important. We learned to assign different jobs to different people, based on their age and specialisation,” said Út. The team now has 115 members who are mostly from four communes of Lai Vung District – Tân Hòa, Vĩnh Thới, Long Hậu, and Long Thắng. Among them, more than 50 per cent are 60 and above, the youngest are in their 50s. “I have been with the team for four years. Frankly, this volunteer job is physically heavy for us seniors. Yet, as we share the job, we feel it is less tough. To see a road or a bridge get finished, and local people, especially children commute easily is such a rewarding experience. It motivates us to continue building new bridges and roads,” said 76 year old Nguyễn Hòa Ân, a resident of Long Hậu Commune. The team has expanded its work outside Lai Vung District to neighbouring Lấp Vò and Châu Thành districts. 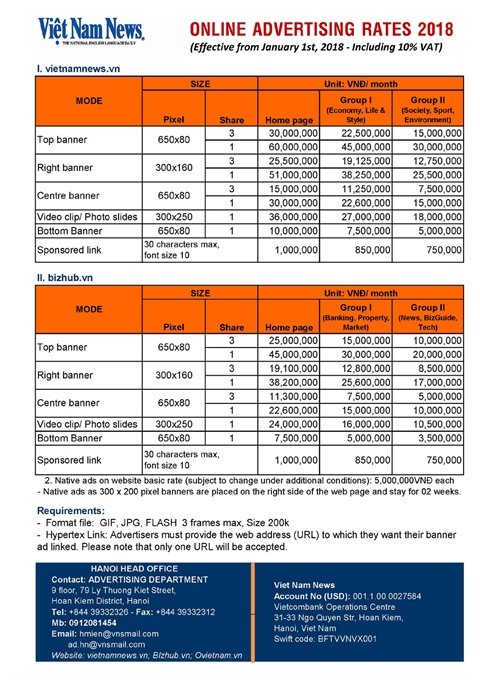 “Whether it is our district or others, all our work is voluntary. But, for those who live far from the construction site, the locality or contractors should give them some commuting stipend. While we work on a bridge or road, locals always offer us food,” said Lộc. 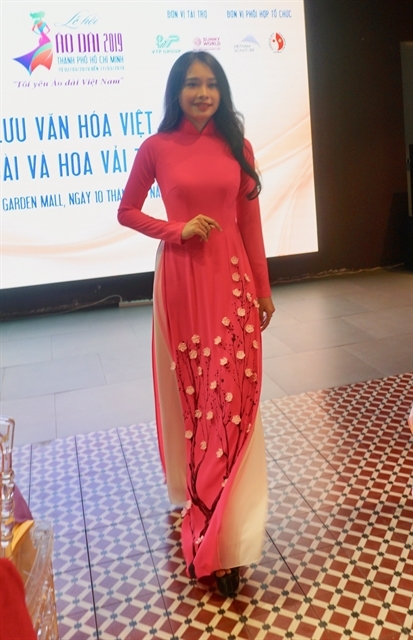 “We also wish to have health insurance and accident insurance, just in case of unfortunate incidents,” said Lợi. Lai Vung District’s People’s Committee Chairman, Hồ Thanh Phương, praised the team. 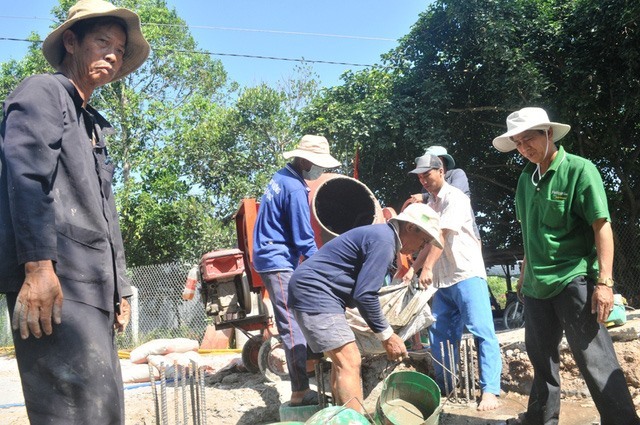 “The volunteer construction team, over the last few years, have constructed more than 90 cement bridges and kilometres of cement roads for Lai Vung District and other localities. This has improved the face of the rural district," he said. Ready to roll: Võ Văn Lộc (known as Út Lộc), a 82 year old native of Tân Hòa Commune, Đồng Tháp, along with his senior neighbours, founded the voluntary construction team in 2008.